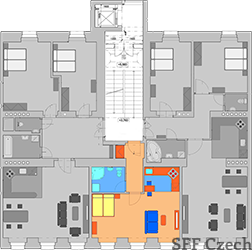 The short or long term rent of furnished studio (35 m2) situated on the 1th floor in a well maintained building in street Sazavska, Praha 2 – Vinohrady. The flat has an entrance hall, living area with night zone, windows facing quiet street and fully- equipped kitchen corner (fridge, oven, electric stove, microwave oven, electric kettle, coffee maker, toaster, dishes). Shower bathroom with washing machine and dryer. Other equippment: TV, DVD, satellite receiver, WiFi, iron, ironing board, vacuum cleaner. Building has an elevator. Indoor parking available. Close to tram, bus and metro A – Namesti Miru. In vicinity all amenities. The monthly rent (with 1 year lease): 21.000 CZK + 3000 CZK fixed services charges + 2000 CZK accountable utilities based on real consumption. Internet included in price. 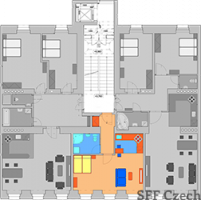 The short term rent: 30.000 CZK including all utilities and internet / per month.